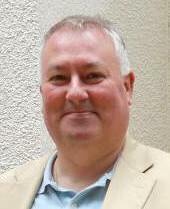 John passed away in Frimley Park Hospital on 1 February 2014. 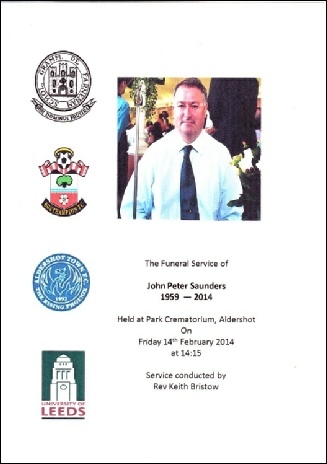 His funeral was held at Aldershot Crematorium on 14 February. During the funeral service, Chris Stacey read a eulogy celebrating John’s life, which we will be posting here shortly. Mike Mehta read the poem Death is Nothing at All by Henry Scott Holland. Old boys and staff who attended John’s funeral included John Clarke, Martin Collier, Roger Edgell (representing the OFA), Rev. John Innes, Mike Innes, Mike Mehta, Chris Nelms, Chris Stacey and Julian Walden. You can see a copy of the Order of Service here (pdf format) - or click on the cover (right). John’s obituary, published in the Farnhamian (March 2015) can be read here. We have added a gallery of photos (see below), which celebrates John’s life. If you have any others you can share with us, then please use our contact page. We also link to John’s original “Where Are They Now?” Page.